Has anyone managed to spot Jupiter in the last couple of nights? I keep falling asleep just as it's about to show up and then at 3am it's not in the same place anymore. Gah. Just had a look, those pictures are godsmackingly awesome. 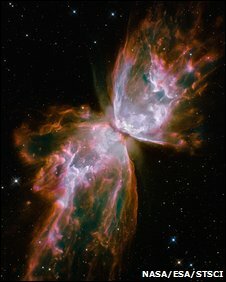 There's always so many pics of space around, but the hubble ones are always fantastic. I love that even though I kind of know what space, and it's constituents, looks like it's never anything less than breathtakingly beautiful. Incredible pictures, aren't they?!! Hubble is up and running again - fantastic! crystalball wrote: Has anyone managed to spot Jupiter in the last couple of nights? I keep falling asleep just as it's about to show up and then at 3am it's not in the same place anymore. Gah. Incredible, isn't it? Who would expect a webcam in NASA's JPL that allows you to watch the rover's construction and testing! okay, so that is kind of amazing! i have no idea what they are actually doing right now but it is quite addictive viewing. So who's going to interpret gravitational waves for us, then? So there's a new kind of drive thing for spaceships which shouldn't work but does, or something. An impossible space drive. Impossible is the best kind of anything, of course. humblebee wrote: So there's a new kind of drive thing for spaceships which shouldn't work but does, or something. An impossible space drive. Impossible is the best kind of anything, of course. has an explanation of how it works that I understand though I'm not clever enough at science to know how feasible it is. I like how on my way home from work at the moment that Mars is to the left of me and Jupiter's on the right. It gives me a lovely feeling of interplanetary symmetry. tonieee wrote: I like how on my way home from work at the moment that Mars is to the left of me and Jupiter's on the right. It gives me a lovely feeling of interplanetary symmetry. Just realised it's Venus not Mars that I can see on my left. Mars is there too but a lot fainter. That was a bit of a cosmic faux pas. tonieee wrote: I like how on my way home from work at the moment that Mars is to the left of me and Jupiter's on the right. In news to cheer us all, the impossible space drive has now been tested and actually works. If they build a spacecraft powered by it, it could reach the moon in four hours. This is my favourite bit of that article: 'scientists still have no idea how it actually works'. It's very pleasing for some reason. This Is Helena wrote: This is my favourite bit of that article: 'scientists still have no idea how it actually works'. It's very pleasing for some reason. It is, isn't it? I wonder if that's because artists, philosophers, lovers – AND HEY, probably most people in their everyday lives – have to work around uncertainty all the time. We can't be sure about x, but we can't let that stop us reaching y; the time needed to resolve it is a luxury we can't afford, or perhaps the uncertainty even holds value in its own right. So it's nice to see scientists working around it too, rather than waiting around until everything's just so.